Last week's WOW prompt was 'When The Ground Shakes', an ode to the devastating Nepal Earthquake which splintered the ground as well as the lives of people in our neighbouring country. We got some very touching blog posts expressing their views over the tragedy, and we've picked the best of them for this week's WOW badge. Please save the below WOW badge and display it proudly on your blog. Thank you BlogAdda Team :) Now i can proudly flaunt my first WOW Badge! Thanka BA feels good to be in the list again. 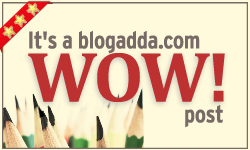 Thanks a lot BlogAdda Team..It is my first WOW badge..It motivates me to keep writing and improve the next time.